Confusion & delay is never a good thing. Especially when it is occurring in a classroom of 30 plus middle school students. It is very irritating when you are trying to teach a lesson in class using Google Drive only to discover that the kids are baffled because they signed into Drive using their personal Gmail account rather than their Henrico Google Apps For Education (GAFE) account. This is where the Google Chrome multiple user feature can help preserve some sanity. 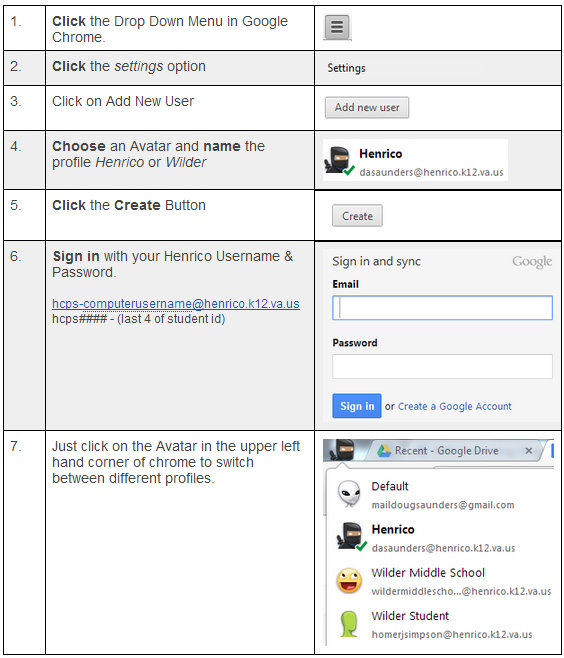 Students can create 2 profiles in the Google Chrome Browser. One profile can be set up to be used for their personal Gmail, non-school related work, the other can be set up using their GAFE credentials. The profiles each house different bookmarks, apps, calendars, and internet history. When the profiles are created the student's username is tied to that account, so they no longer need to type in the obnoxiously long - hcps-studentname@henrico.k12.va.us every time they want to log into Drive/Chrome. Below are directions explaining how to set up multiple user profiles in Google Chrome.